﻿﻿﻿﻿﻿﻿﻿Planning and creativity help create a successful family campout. Want to take the family camping but haven’t been in years? Worried about rusty skills or lack of proper equipment? You’re not alone! 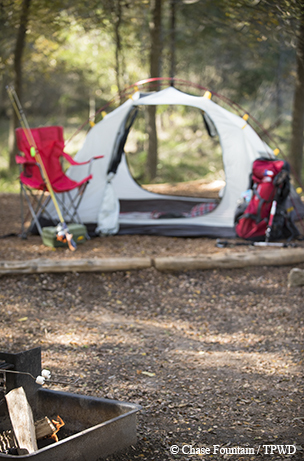 TPWD’s Texas Outdoor Family program hosts workshops across the state that can help you painlessly get your camping mojo back. Families can borrow equipment, learn how to set it all up and participate in fun outdoor activities. Learn more and sign up for a low-cost session at texasstateparks.org/tof. It doesn’t take much to make camping more enjoyable for beginning and experienced campers. Here are a few tips to get you started. TENT: Some people choose a trailer over a tent for ease in packing and setup as well as weather resistance. But camping in a trailer can seem more like being inside than outside and brings additional expenses for upkeep and storage. Tents may not be quite as comfortable, but the payoff is a quieter, more nature-centered experience. During warm weather, a tent with screens will allow a breeze to blow through as well as give you a new perspective on stargazing. During wet weather, a tent with a “bathtub”-style floor (the tent floor curves up to meet the walls) is more waterproof because the seams are several inches above the ground. Don’t forget to pack a rain fly that covers as much of the tent as possible. For a different experience, try sleeping in a hammock. It makes a good place to sleep at night or nap during the day. SLEEPING PAD: Although kids can be comfortable on a sleeping pad, adults usually prefer an inflatable mattress or a wide, cushiony cot. Whichever you choose, remember to bring a thick blanket to place under your sleeping bag so you are not sleeping on a layer of cold air. Sleep under a sheet when it’s warm; wrap a small blanket around your shoulders in colder weather to keep frosty air out of your sleeping bag. Remember, the most important thing to do before you crawl into bed is to put on clean, dry clothes. The moisture in your clothes from the day’s activity will chill at night and keep you from warming up. COOKING: Think outside the home kitchen when planning meals. Trying different foods can make a camping trip more memorable. Look online for recipes. Try one-pot meals, pie irons (think panini) or foil pouches, grilling over a fire or experimenting with a Dutch oven. Consider using oven bags to line your pots or Dutch oven to make cleanup easier. Some state parks give lessons on how to cook outdoors; find one near you at www.tpwd.texas.gov/calendar. A little time spent at home to organize and prepare ingredients in advance helps when cooking at camp. Remember to take recipes, or write them on the bags holding your ingredients. Decide what equipment to take after you plan your menu. Many recommended equipment lists can be found online. A propane stove with two burners that light instantly and maintain pressure is an advantage. ACTIVITIES: There are many options when it comes to entertainment. Are you happy reading, surrounded by nature, or do you prefer catching a fish, hiking a scenic trail or playing games with your family? Nothing beats a fire while camping. Make s’mores or popcorn or listen to night sounds. Relax in a comfortable chair while you mull over the events of the day. When packing for the trip, decide whether you need a footstool or a side table, and for cold weather, you might bring an extra blanket to trap heat while you sit in that comfy chair. If you are fairly new to camping, find a park close to home or set up camp in your backyard. The beauty of camping is that it’s really just about time spent outside with the people you love.